Today's guest bloggers are Caroline Ballhorn and Jenny Lee Craig, the talented artists who run Tin Can Studio. During the 2014-15 school year, they collaborated with educator Dorianna Chessa at Windsor House School to develop and present a memorable hands-on learning experience for students. 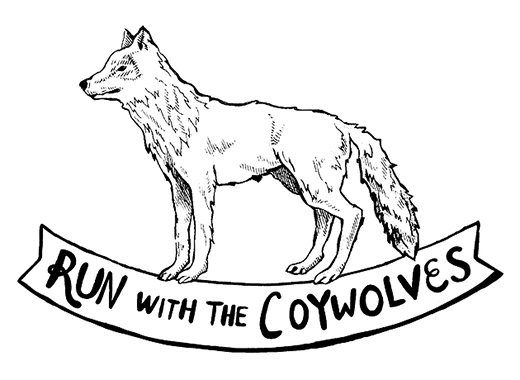 Their project, Run with the Coywolves: An Exploration of Art and Nature, received funding from a large-scale Artists in the Classroom grant. Read on to learn more about this exciting experience — and discover how YOU can bring the arts into the lives of young people. 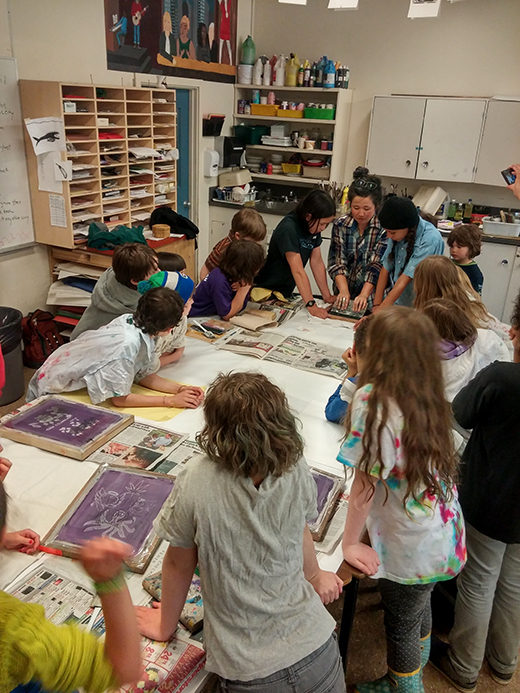 We like to tell the students at Windsor House School in North Vancouver, BC, that their new program, the Windsor House Coywolves, came to be when two artists and an educator spent an evening together talking about art inspired by nature and howling at the moon. Of course, that's not quite true — we didn’t actually howl at the moon... but, we did have some great conversations that sparked in us a desire to create an experience for students that took them out of their classrooms into natural locations, and transformed these places into sites for artistic investigation! For 10 months we worked with an educator named Dorianna Chessa from Windsor House School. 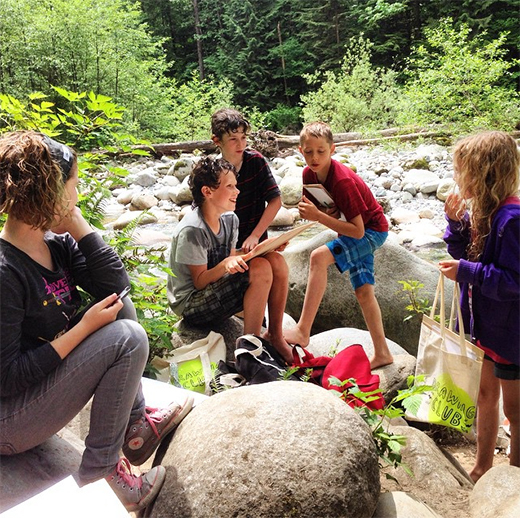 When we first met with Dorianna about building our project, she told us about a really amazing course she'd just taken about nature-based education called Coyote Mentoring. 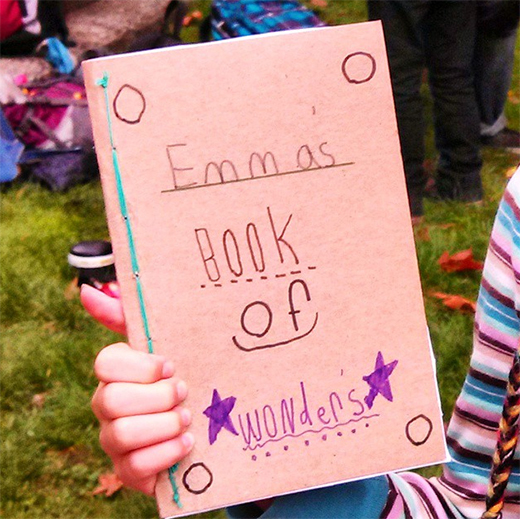 Taught at the Wilderness Awareness School in the Duvall, Washington, it's an educational approach that uses children's innate enthusiasm for the natural world to engage them in learning — developing their capacities for problem solving and full expression, while re-awakening their natural sense of wonder. 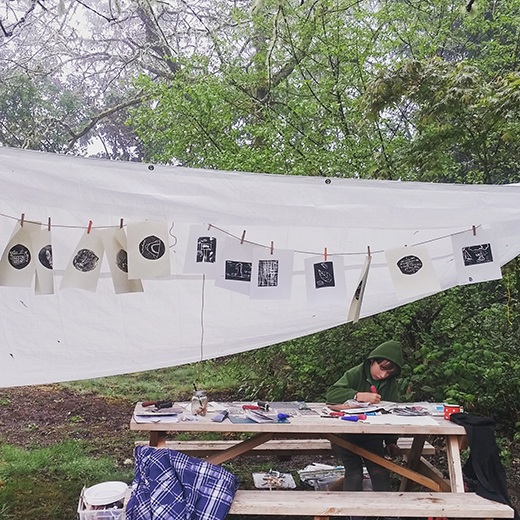 Our program built on these ideas and adding an artistic slant, inviting students to various outdoor locations to learn a variety of artistic mediums in a series of hands-on workshops. Tin Can Studio is a collaborative project by us — Caroline Ballhorn and Jenny Lee Craig. We work with communities, programmers and educators to facilitate all kinds of creative activities to individuals of all ages. We often do our work out of our mobile art studio, a renovated 1969 vintage trailer, that's been thoughtfully designed to be a perfect space for making all kinds of art. During this program we brought our studio to some of our sessions, and we also set up a temporary 'art studios' wherever we found ourselves. Each workshop introduced a different medium to students we were working with and over the course of the 2014-15 year we learned a lot! We learned printmaking techniques, practiced drawing techniques, created soundscapes, bound our own books, experimented with story telling and photography, geocached, built rafts, and much more. And we had the opportunity to spend the majority of our sessions outside in some of the most beautiful parks, beaches and forests our province has to offer. We went to Cates Park, Lynn Valley, Saltspring Island, Lighthouse Park, Vanier Park — just to name a few! In every outing we did with the Coywolves, we emphasized responding creatively to the environment we were in. We found inspiration in the things we saw, felt, touched, heard, and smelled. Each creative investigation invited students to learn an art making technique while considering the local flora and fauna, wildlife, and cultural history of the places we were visiting. In all the work we did, we aimed to treat each other and the land we were on with respect and gratitude. As our year with the Coywolves drew to a close, we worked with the students to put selections of the work we've created into a publication that tells the story of our program and the shows breadth of the work we've created. The publication was launched at the school's final celebration — it was a blast! 1. 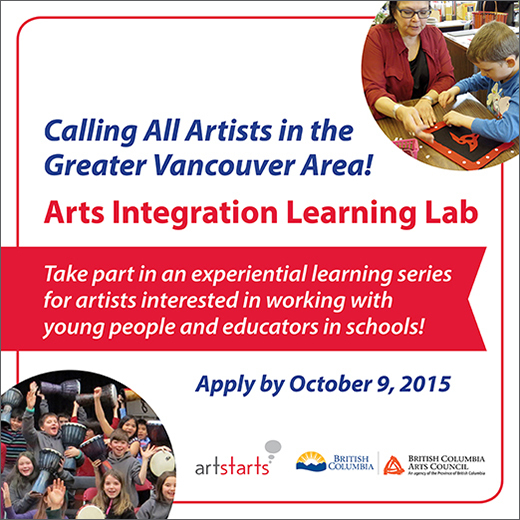 Teachers: Register for the upcoming Pro-D day at ArtStarts, featuring Tin Can Studio! 3. Teachers and Artists: Apply for Artists in the Classroom grants!